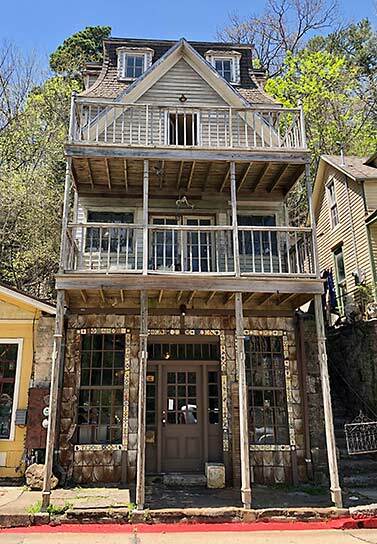 Historic houses cling to rocky hillsides in Eureka Springs, Arkansas. its winding streets, the entire city is on the National Register of Historic Places. In the beginning, Eureka Springs, Arkansas, was all about the healing waters. In 1880, the area’s numerous naturally- flowing springs were credited with restoring the sight of a woman who had been blind for years. This, and other seemingly miraculous restorations of health, drew thousands of visitors to this narrow valley in the Ozark Mountains of northwest Arkansas. Soon, modest cottages and gracious manors lined steep, narrow streets looping around rocky outcroppings. At its peak, Eureka Springs had a population of more than 20,000. The development of modern medicines in the early half of the 20th century reduced the number of those drawn here by the hope of relief from pain and illness. But the town’s natural charms continued to flourish. Today, 2,000 residents welcome more than a million visitors a year who come to admire the architecture and enjoy the galleries, boutiques and restaurants that occupy well-preserved Victorian buildings. Eureka Springs Mayor Robert “Butch” Berry, said, “In Eureka Springs we have woven our history into the daily fabric of our lives. We are proud of how well our community holds on to the past while looking to the future. The majority of town still appears like it did in 1890 complete with all styles of Victorian architecture, from the Rosalie House, a stunning example of Eastlake and Steamboat Gothic with incredible gingerbread woodwork, to one of the first "tiny" homes, a 4-room house on two floors. The commercial district has also remained the same, since the early 1900's. 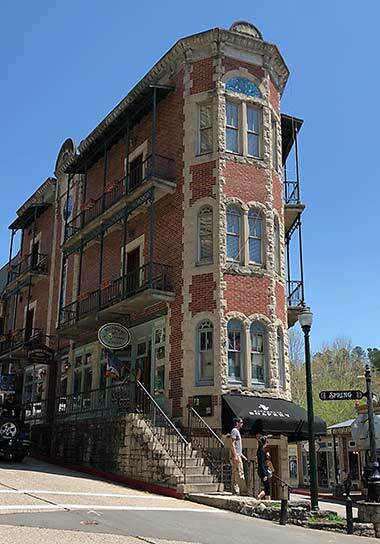 The Basin Park Hotel is in Ripley's Believe or Not, as being a 7-story hotel with every floor on the ground floor, due to the mountainous terrain of Eureka Springs. You won’t find a single traffic light anywhere in this town. You also won’t find any two streets crossing at right angles that carry the same name. 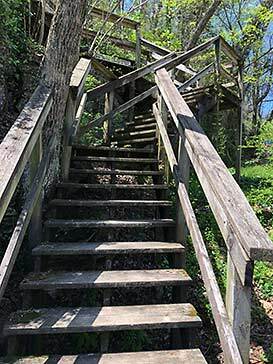 And with over 200 miles of native limestone retaining walls, our past citizens have created a village which gave Eureka Springs, one of its nicknames, "The Stair Step Town." Perched high above the village is the 1886 Crescent Hotel & Spa, recognized by the National Trust for Historic Preservation as one of America's Dozen Distinctive Destinations. It’s 72 rooms are said to contain a few extra guests, who checked out…but never left. In 2007, the hotel was featured on the television show Ghost Hunters. Believers and non-believers alike can enjoy the hotel’s 75-minute ghost tours that depart nightly at 8 p.m. Hotel guests can huddle around the fire to hear Ozark stories of witches, monsters and ghosts and make a midnight visit to Eureka's most haunted site…the Crescent Hotel Morgue. The Eureka Springs Carnegie Public Library is one of four Arkansas library buildings built with funding by Andrew Carnegie. The Classical Revival-style building, constructed of native limestone, is listed on the National Register of Historic Places. Its basement is part of an Underground Eureka Tour. 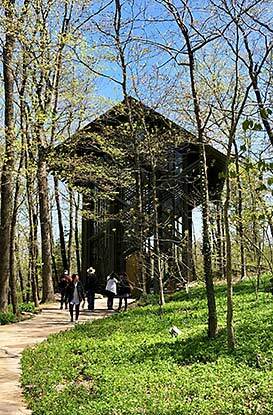 In the midst of verdant hills on the edge of Eureka Springs stands Thorncrown Chapel, a light-filled wood confection of 6,000 square feet of glass. The chapel’s 48-foot high walls encompass 425 windows that allow a connection with nature and an opportunity for quiet reflection. The chapel, which sits on a base of 100 tons of native stone and colored flagstone, was the winner of the American Institute of Architects Design of the Year Award for 1981 and AIA’s prestigious 25 Year Award. There is no admission fee, but donations are accepted. Church services are held at Thorncrown Chapel at 9 and 11 a.m., April through Oct., and at 11 a.m., Nov. through mid-December. All are welcome: 12968 US-62, Eureka Springs, AR 72632. Eureka Springs and Thorncrown Chapel are just two of the stops on Road Scholar’s Essential Arkansas trips. Road Scholar, formerly known as Elderhostel, provides programs that combine the usual pluses of package tours with the advantages of travel with intellectually curious friends. For information, visit www.roadscholar.org. He who is outside his door has the hardest part of his journey behind him. Dutch Proverb.